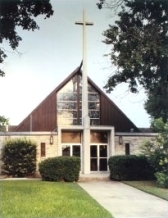 Redeemer is the fifth oldest congregation of the Lutheran Church — Missouri Synod in San Antonio. Organized in the spring of 1942, Redeemer actually has roots going back as far as the fall of 1937. In October of that year, tent services sponsored by the Lutheran Men’s Club of San Antonio, in cooperation with the Pastor’s Conference, were conducted on Grammercy Place between Fredericksburg Road and Elmendorf, near the Woodlawn Community Center. Known as the Woodlawn Terrace Mission, we moved from tent services to holding services in the Monticello Building, which was located at 1921 Fredericksburg Road. While attendance at worship in those early days averaged from twenty to thirty souls, in October 1940, Woodlawn Terrace Mission was declared a permanent station. 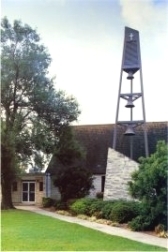 Ground-breaking ceremonies for the permanent chapel were conducted on November 2, 1941, and building operations began on November 26. Steel had already been restricted before building operations began, so materials were scarce. In spite of the outbreak of World War II on December 7, 1941, the Lord allowed building operations to continue without interruption. On January 25, 1942, the cornerstone was laid. While austere conditions prevailed throughout the construction, and in spite of the outbreak of World War II, a gracious wonderful God enabled the building to continue without interruption. The church dedication was held on Palm Sunday, March 29, 1942. Redeemer was designed in a contemporary expression of Ecclesiastical Architecture. Instead of a crucifix, an impressive empty cross — symbolizing the risen Christ — dominates the exterior design as an appropriate symbol. All of the lines in the composition lead to this focal point, the cross. The walls are built of enduring limestone exposed both inside and out. The interior plan is a cruciform in the early Christian tradition. Wood arches support the roof and give an unobstructed view of the stained glass windows over the altar and the narthex wall. The wood paneling behind the altar is designed with diagonal lines to carry the eye upward and inward.